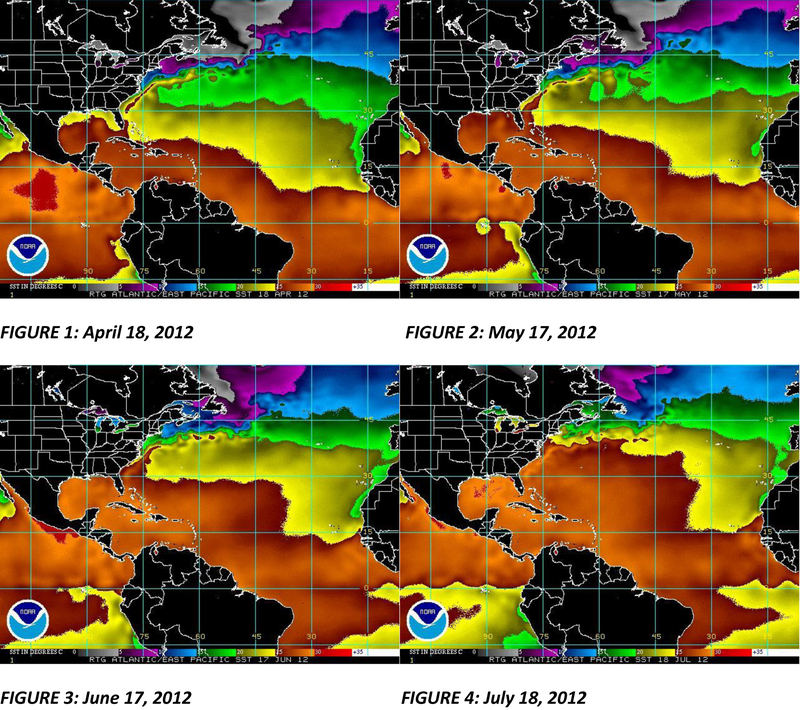 So far, it’s been a strange 2012 Atlantic Hurricane Season! 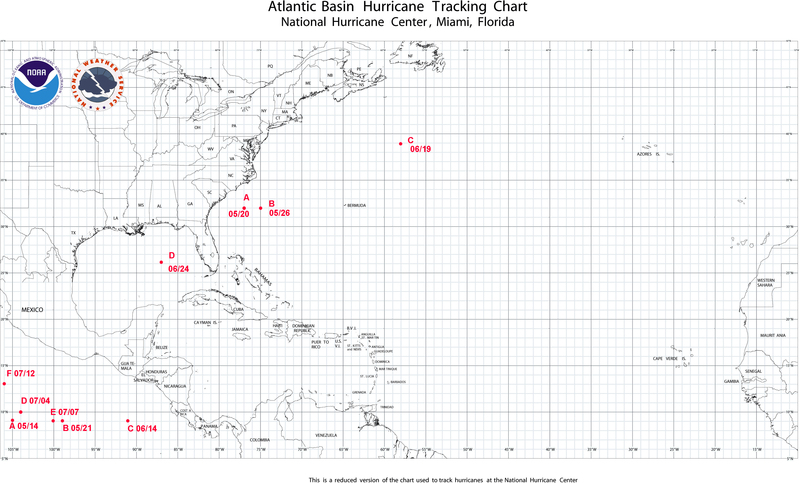 What is going on in the Atlantic basin regarding the 2012 hurricane season? 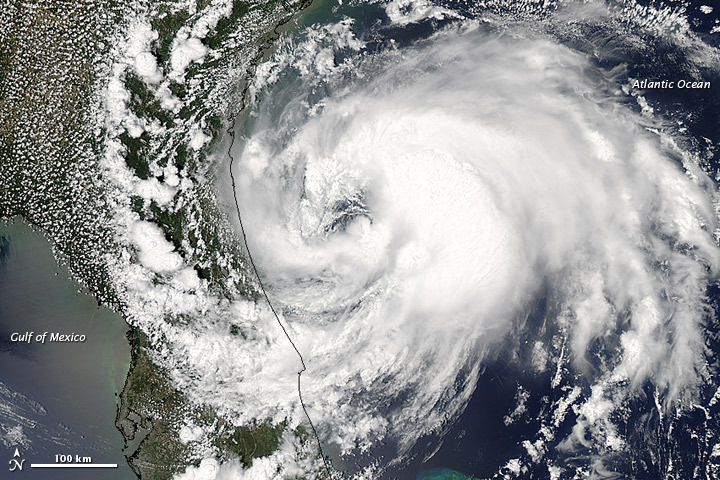 After an early start with two pre-season tropical storms, ALBERTO and BERYL, generating respectively on 20 May 2012 and 26 May 2012, the first time this has happened in the last 104 years, nothing much has happened. Then there was the lonely hurricane of the season so far, extra-tropical CHRIS, which generated over the open waters of the Atlantic some 1,000 kilometers northeast of Bermuda, at LAT 39N LONG 58W, a region of the Atlantic ocean not really known as a typical source of cyclogenesis. More recently, on 24 June there was tropical storm DEBBY becoming active in the Gulf of Mexico, and since then all has been mostly quiet on the Atlantic front except for bouts of stormy weather with lots of rain and thunderstorms affecting Florida and several other Gulf and Atlantic coastal states, but nothing approaching cyclonic conditions, at least through today 19 July 2012. (d) Hurricane Alley, that corridor across the tropical Atlantic marking a frequent route for tropical waves moving from the Eastern Atlantic just south of the Cape Verde Islands toward the Lesser Antilles and the Caribbean, appears to have also shifted toward a more southern location. 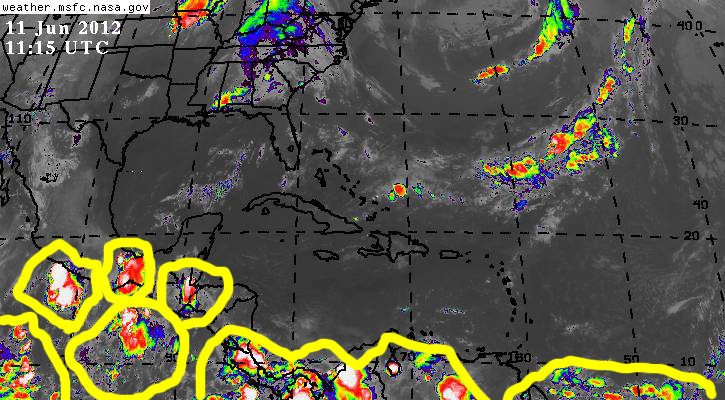 A consequence of this shift has been that numerous tropical waves have crossed over the northern region of South America or Panama emerging over the eastern North Pacific, where they have already contributed to the generation of six tropical cyclones close to the coasts of Central America and Mexico in a span of less than eight weeks. (e) More recently, just over the last few days a new cyclone depressing factor has made itself present over a large region of the Atlantic; we are referring to dust-laden Sahara Wind, which is reaching as far west as the Caribbean, Florida and the Gulf and has the ability to inhibit rain and stormy weather, both of which are required for cyclogenesis. What is also interesting about these factors, which appear to be affecting the generation of tropical cyclones in the Atlantic basin in 2012, is that some of them such as the southward shift of both the ‘tropical wave assembly line’ and ‘hurricane alley’, and the ‘hot spot’ of cyclogenesis near the Pacific coasts of Central America and Mexico, began to be noticeable during the 2010 and 2011 Atlantic hurricane seasons. The surface waters of the Eastern Pacific off the coast of Ecuador and Peru have been warming-up at a rapid rate recently, and although conditions over the Eastern Pacific are currently in what is known as a ‘El Nino neutral’ state, NOAA has already issued an ‘El Nino watch’. So it appears there may be an onset of El Nino during the second half of 2012 and into 2013, which depending on its intensity may have a depressing effect of tropical cyclone generation over the larger Atlantic basin. Only time will tell how these various factors combine to determine how the 2012 Atlantic hurricane season will play out for the remainder of the year, and what will happen on a worldwide scale in terms of total number of named tropical cyclones. What is clear, in my opinion, is that global climate change in general and global warming in particular are affecting cyclogenesis both in the Atlantic basin and worldwide. These effects might be somewhat different than those some scientists and models had predicted, which only illustrates the need for additional research and continued monitoring of tropical cyclone activity worldwide. I continue to subscribe to the theory, I put forward a few years back, that global warming may be gradually raising the threshold for cyclogenesis to occur and this in turn is resulting in fewer tropical cyclones annually, and more tropical cyclones being generated near the periphery of some of the long identified oceanic sub-basins. Only more research and accumulated data on annual tropical cyclone activity will confirm or deny my theory, but in the meantime it makes for an interesting topic of discussion.